This week saw the new year and the return to school. I’m one of those people who is happiest at home on New Year’s Eve and we spent a quiet evening in before enjoying a beach walk and morning treat at a local cafe on January 1st. We were all back to school on Tuesday but it’s been a shock with the early starts, we’ve all been so tired this week. One of the things I always wanted to share with my children was my love of reading. Fortunately Little Miss is an avid and confident reader and we share a delight in good books. 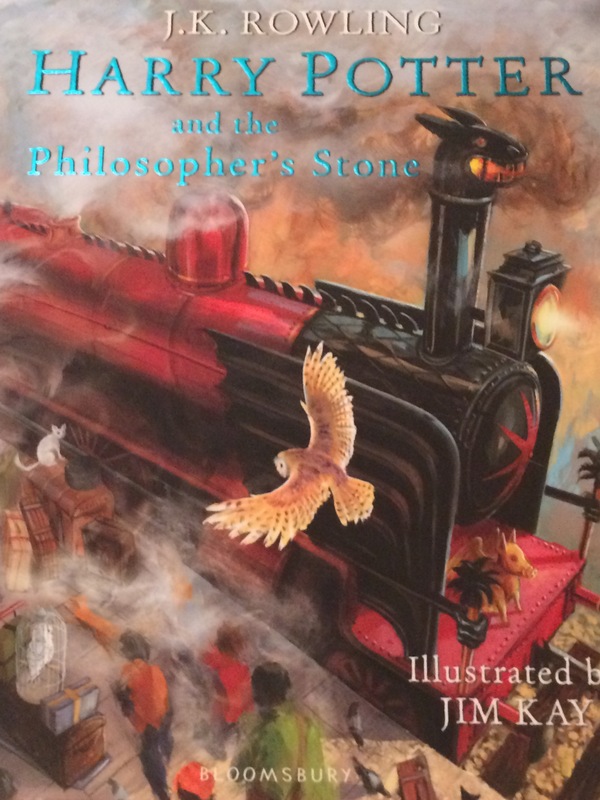 We were both really excited that Grandma and Granfer bought her the illustrated version of Harry Potter and the Philospher’s Stone and this week as we have settled back into our routines, we have been reading it together snuggled up on her bed. I love that I am able to share her enjoyment as she discovers Harry Potter for the first time and cannot wait for all our Harry Potter chats over the coming years. On Monday, our last day of the holidays we went to the neighbouring town to watch Moana in the independent cinema. It’s such a treat to see a film in this cinema, it’s been refurbished and is in immaculate condition in a 1950s style with lots of original features. I really enjoyed Moana, the strong female lead, the diversity, its legend theme rather than a love story and the amazing scenery. I also decided I want to rock like Moana’s granny when I’m older! Watching Moana was a really nice way to spend the last afternoon of what had been a special holiday. I am incredibly organised and like to finish everything off for the season. I made our 2016 photo year book this week and am just awaiting its delivery. Every year I consider doing it monthly to make it a little easier but end up reflecting on the full year at the end of December. I love to take photos and it was difficult choosing my favourite photos, I think there are around 180 photos in the album, but as that’s only around 3 a week I don’t think that’s too bad considering the number of photos on my iPhone. An uninspiring category this week, simply lots of layers as it’s been freezing. I haven’t been anyway near the sales so no new purchases to enjoy and model. I like a a little theme for my listening so on New Year’s day I listened to some new year tunes. Happy New Year by Abba, New Year’s Day by U2 and Queen of the New Year by Deacon Blue. The Abba track is such a lovely song and the words very prophetic, it talks about changes 10 years from now when neighbours become friends, the 10 years on is 1989, one of the most momentous years of the 20th century. And finally, we’re looking forward to a quiet weekend, we have cricket club on Saturday and then we’re off to big town to choose the tiles for our bathroom renovation and possibly some bowling, an ‘incentive’ (bribery) for the children to counter the boredom of a tile showroom. I love your photo books, I really want to do this- I have SO many photos that need printing out and this is a great way of arranging them. I too am a Harry Potter fan and can’t wait until mine are big enough to enjoy reading the books! I love the idea of a photo book, i have cylinders made using photos from the previous year. The photo books are great and worth the effort, it’s lovely to see the same events but us all older and wiser every year! Very organised, I’ve only just finished my 2015 photo album! I think it was September actually but it feels like yesterday. It takes me so long but I do love having them printed out. Oh wow what a wonderful idea with the photo albums, I wish I had thought of that years ago when my boys were small. I am so loving HP it’s the highlight of my evening at 8pm settling down to read!